She was adopted through a rescue organization and her papers clearly state that she is a dog. She certainly looks like a dog, wagging tail, flapping tongue and floppy ears. I’m not sure. This one is . . . . different. You won’t find her at the door wagging her tail when you come home. Bear can completely ignore you. Often, she will not even lift her head from whatever comfy chair, couch or bed she has chosen for one of her 25 naps each day. She can lay utterly motionless, no twitching ears, no subtle tail movement while you call her name or even stand directly in front of her. She views all food, as highly suspect. Never, ever does she eat anything without lengthy hesitation and thorough examination. She sniffs and circles the bowl carefully before eventually testing a small bite which she will carry in her mouth to another room for actual consumption. You could put a medium rare ribeye steak in her bowl and she would view it with extreme caution. For the record, we have never tried to poison her. She has no reason to suspect us of ill will. Quite the contrary, we actually make all of her food. A nice blend of brown rice and mixed vegetables cooked in a Dutch oven over chicken that has been browned and braised for a perfectly crispy skin and tender meat. 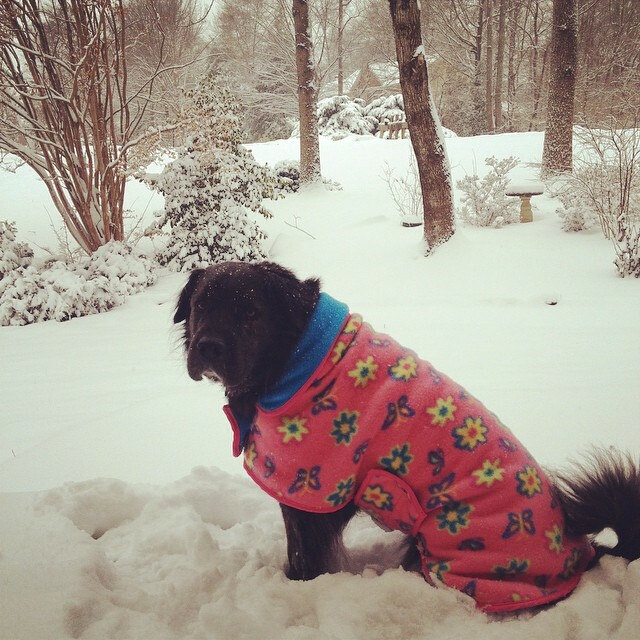 Bear is a 52 lb dog that enjoys wearing clothes. Finding clothes to fit her is not easy. Her body is rather ill proportioned, with her head being at least one size too big . She happily wears anything from party dresses to pajamas, Halloween costumes and holiday appropriate hats. She has an assortment of jackets suitable for most any weather. She waits patiently for her yellow rain slicker when it’s raining, preferring to stay dry in adverse weather. She happily trots down the sidewalk in her sporty red quilted vest in the fall and pink flowered fleece coat in the winter. She does not play "fetch". She has no idea why you throw things. She body checks like a hockey player. At the suggestion of a favorite activity, she sprints from a resting position, does a combination jump half twist and throws her entire body into you. It hurts. While Bear is generally indifferent and uninterested in your gestures of affection directed at her. However, she does like a group hug. For some unknown reason, humans embracing gives cause to jump up from resting position to join in on her hind legs. She enjoys floating on water. Insists on being pulled out of the water up onto the raft, kayak, canoe or paddle board you're on so that she too may enjoy this relaxing activity. If you should happen to fall off into the water, not a problem. She doesn’t need your company to enjoy a nice float. 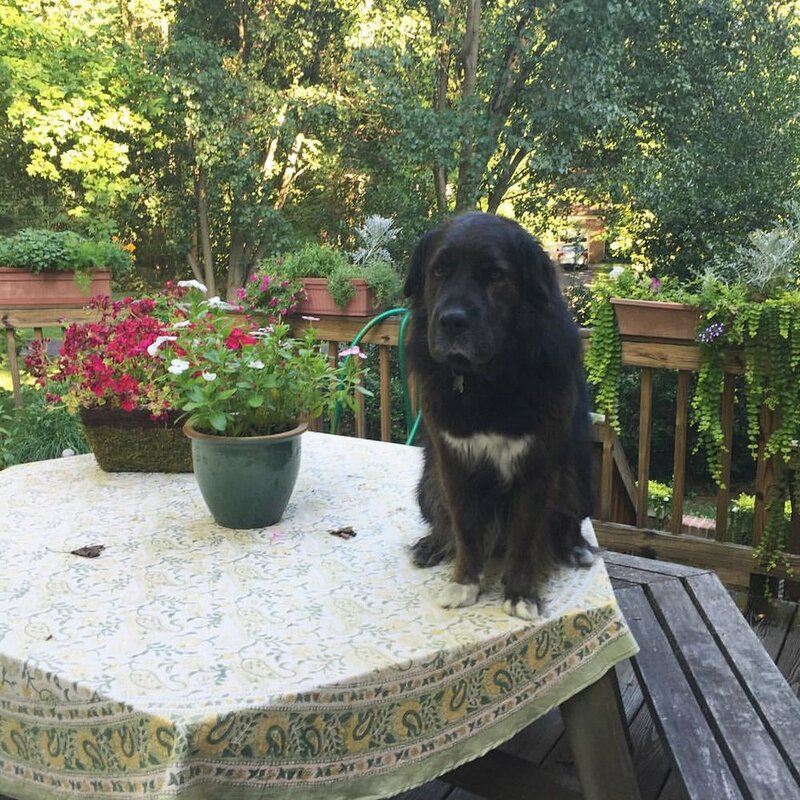 She see’s nothing wrong with sitting on table tops. She prefers not to walk on grass. House breaking put our patience to the test. Teaching a dog to "go" outside is tough when the dog refuses to step onto the grass. She prefers pavement. She insists that any edible treat be placed in her mouth by your hand. In the unfortunate event that the treat falls to the ground while attempting to place it in her mouth, it will stay there. She will not take a treat off the floor. You must pick it up and give it to her again. Her refusal to eat off the floor is not limited to treats. She will not eat anything off the floor. It must be in her bowl or handed to her.